Rabbit Conformation shows - are an increasingly popular wholesome activity for individuals and families. Showing rabbits helps to improve the vigor and physical behavior of each breed through competitive selection. County fairs are common venues through which rabbits are shown in the United States. 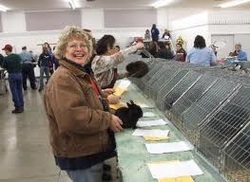 Rabbit clubs at local state and national levels hold many shows each year. On any given weekend one may be able to find a show in most regions of the United States and the United Kingdom. Although only purebred animals are shown, a pedigree is not required to enter a rabbit in an ARBA-sanctioned show but is required to register your rabbit with the American Rabbit Breeders Association (ARBA). A rabbit must be registered in order to receive a Grand Champion certificate. Children's clubs such as 4-H also include rabbit shows, usually in conjunction with county fairs. The ARBA holds an annual national convention which has as many as 25,000 animals competing form all over the world. The mega show moves to a different city each year. The ARBA also sponsors youth programs for families as well as underprivileged rural and inner city children to learn responsible care and breeding of domestic rabbits. Rabbit show jumping (sometimes known as rabbit dressage or rabbit hopping) is a competition in which trained domestic rabbits leap over appropriately sized obstacles. The activity began in the late 1970s in Sweden (where it is known as Kaninhoppning). It was popularized in the United Kingdom following an appearance on the TV show That's Life!. There are more than fifty rabbit show jumping clubs throughout Scandinavia. Some people compare rabbit show jumping to equestrian show jumping. Trainers and devotees can win titles and awards during events sponsored by groups such as the U.S.
Rabbit Agility Association, Rabbithopping-USA, the American Association of Sporting Events for Rabbits, 4-H Club fairs, and other venues. Denmark, Sweden, Finland, Norway and the United Kingdom hold local and nationally sanctioned events. The event depends on the type of rabbit, with separate competitions for small rabbits and larger rabbits. The rules are quite different in all countries except Sweden and Norway, therefore it's hard to organize an international competition. Rabbit jumping is also an activity in America, but has not gained widespread popularity. The official world record in high jump for rabbits is 995 millimetres (39.17 in), by Tösen & Tine Hygom (Denmark). The official world record in long jump for rabbits is 3000 millimetres (118.11 in), by Yaboo & Maria Jensen (Denmark). Mice in Shows - There are several clubs all over the world who host shows for mice, similar to rat shows. Shows are held in the US, the UK, and Australia most commonly. 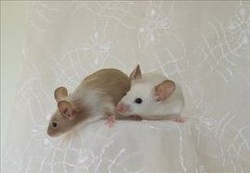 Clubs include AFRMA (American Fancy Rat and Mouse Association, US), ECMA (East Coast Mouse Association, US), RMCC (Rat and Mouse Club of china, US), NMC (National Mouse Club, UK), and more. A quote from the NMC, describes the ideal mouse body type, for showing: "The mouse must be long on body with long clean head, not too fine or pointed at the nose, the eyes should be large, bold and prominent. The ears large and tulip shaped, free from creases, carried erect with plenty of width between them. The body should be long and slim, a trifle arched over the loin and racy in appearance; the tail, which must be free from kinks should come well out of the back and be thick at the root or set-on, gradually tapering like a whip lash to a fine end, the length being about equal to that of the mouse's body. Unless the variety standard states otherwise, the coat should be short perfectly smooth, glossy and sleek to the hand. The mouse should be perfectly tractable and free from any vice and not subject to fits or other similar ailments. A mouse with absence of whiskers, blind in one or both eyes, carrying external parasites, having a tumour, sore or legs with fur missing, suffering from any obvious disease or deformity or kinked tail shall be disqualified." Pigeon showing - Pigeon fanciers from many different countries enjoy exhibiting their birds at their local, inter-state or national shows and competing against one another for prizes. A typical country show in Australia had hundreds of pigeons on display and prizes for the winners. Some fanciers organize exhibitions exclusively for pigeons; one held each year in Blackpool, England that is run by the Royal Pigeon Racing Association was attended by 25,000 people. The £80,000 profit from the show was all donated to charity. The biggest pigeon show of all is held in Nuremberg, Germany which is the location for the German National Pigeon Show, which had over 33,500 (all pigeons) at the 2006 show. 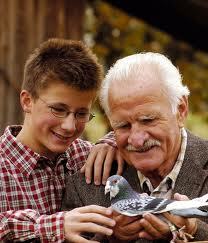 In the U.S.A., there are hundreds of local, state and national pigeon clubs that sponsor shows. The largest shows are the National Young Bird Show, held in Louisville, Kentucky in October, and the National Pigeon Association's Grand National which is held in a different city each year, usually in January (links for both clubs below).